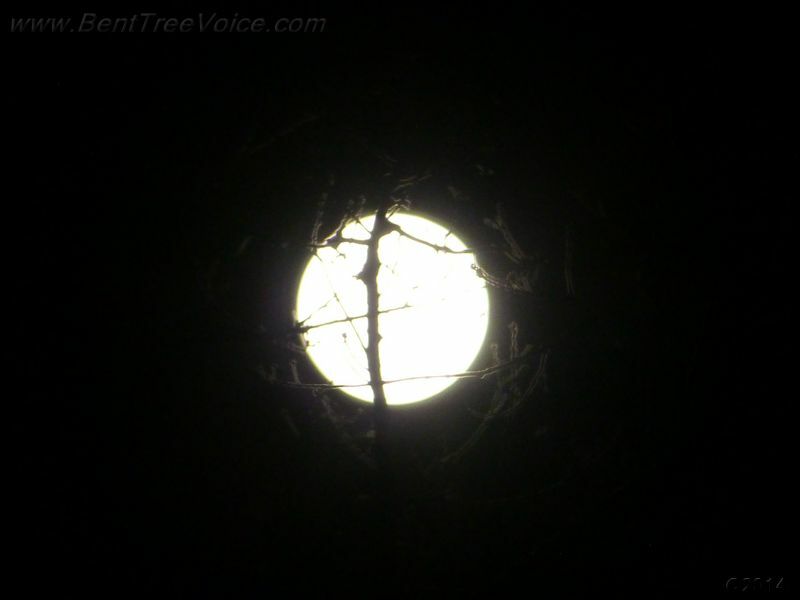 There was a full moon on Wednesday (photos above and below were taken in Bent Tree). The December and January full moons were back-to-back “mini-moons”. Click here for more information. The January full moon is known as the “Wolf Moon”. 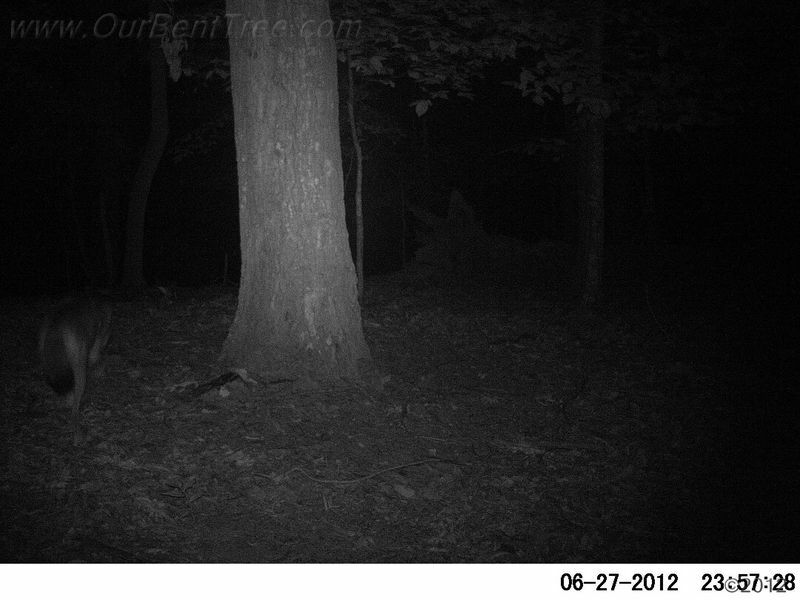 There may not be wolves in Bent Tree, but there are some healthy looking coyotes that can be heard howling at night. Several coyote photos (taken in Bent Tree by trail cameras) have been posted on this website in the past. The most unusual one was of a black coyote. Click here to see the black coyote photo on a previous post. 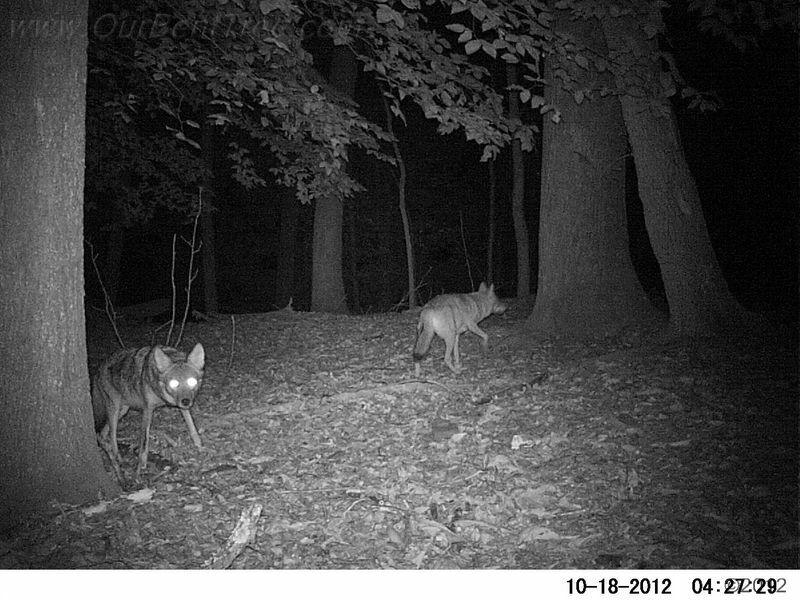 Click here for a previous post on coyotes and whitetail deer concerns. 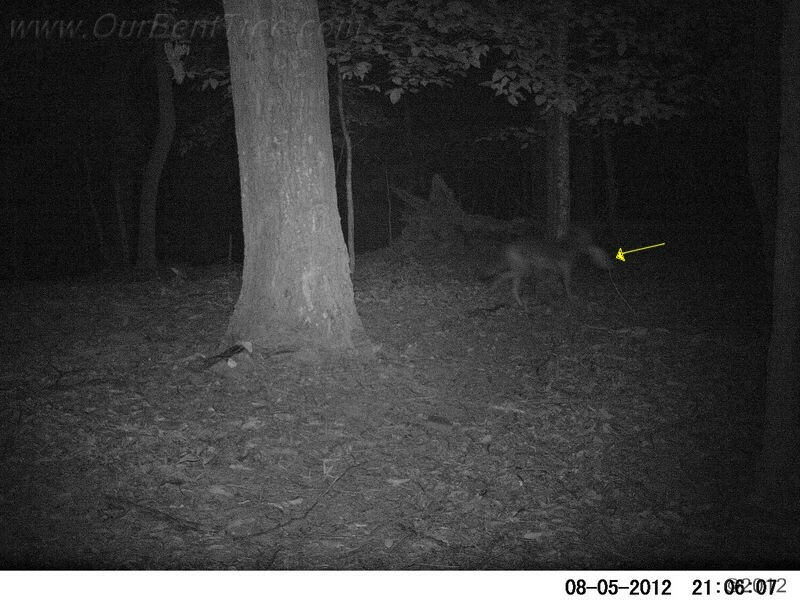 Yesterday’s post included a picture of a coyote in Bent Tree, captured by a motion-activated gamecam in June. 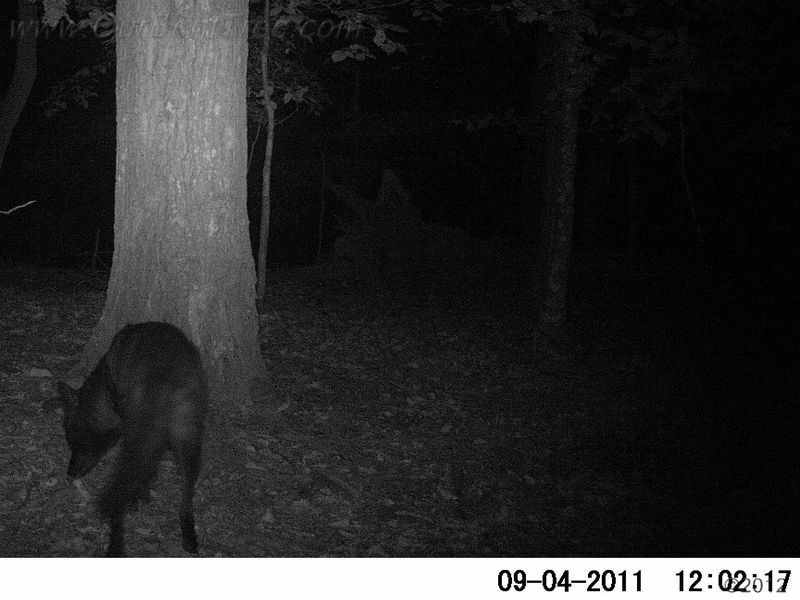 The same gamecam photographed a black coyote in Bent Tree last year (see photograph below). Coyotes are natural predators of whitetail deer. Recent research spearheaded by USDA Forest Service wildlife biologist John Kilgo shows that coyotes may be a game-changer in whitetail deer management. Kilgo led a multi-year study on the effect coyotes are having on deer populations in the southeastern United States. According to Kilgo, “Coyotes are acting as top predators on deer, and controlling their numbers.” Kilgo said that in the last ten years, the South Carolina deer population has declined by over 35%, and that coyotes have played a major role in the decline. See the link below for more information on the research. Following is a May 2012 video interview with Kilgo. A previous post (click here to see) shared pictures of newborn twin fawns that were born in Bent Tree on June 26th. They turned one month old yesterday (if they have survived the bears, coyotes, and humans). The last time I saw the twins was the day after they were born. Later that night, a gamecam in the yard captured a photo of a coyote, so it is a distinct possibility the coyote took at least one of the fawns. 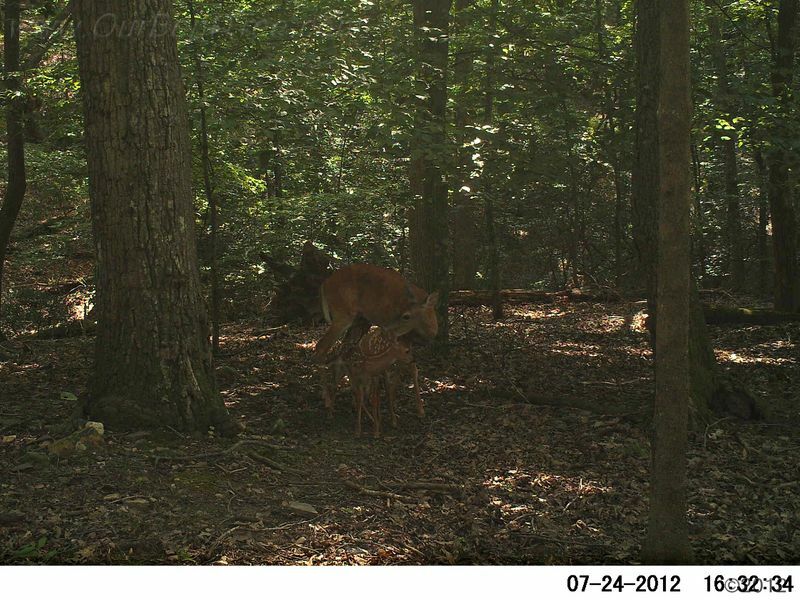 But, three days ago, the same gamecam captured a photo of a doe and twin fawns. Maybe it’s the same deer one month later. 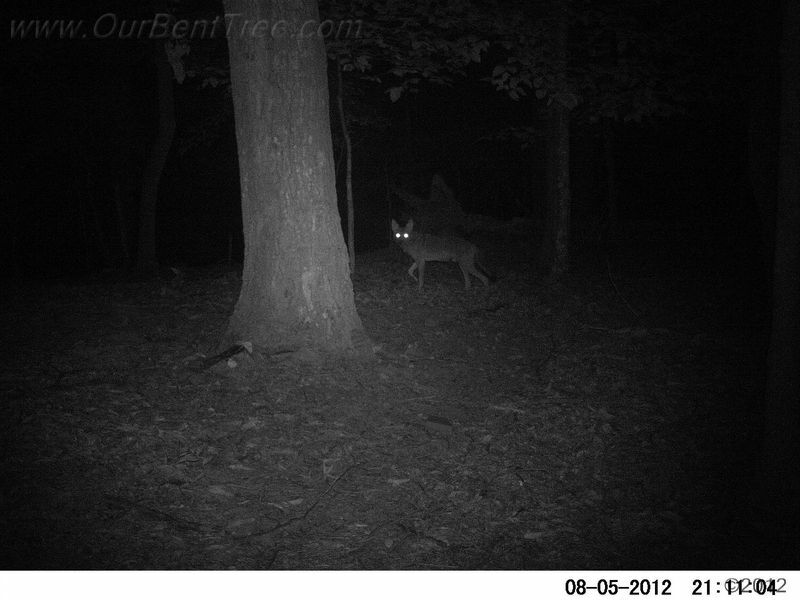 Following are the gamecam photos of the coyote and the deer. You have to look closely to see both fawns (one is nursing, the other is getting washed by the doe). A previous post was about twin fawns born June 26th in Bent Tree (click here to read the post and see pictures of the newborns). The mother and fawns stayed put for over five hours that day. By evening, they were nowhere to be seen. But, they all came back on Wednesday…so the fawns survived the first 24 hours (see pictures below). Bent Tree is home to bears and coyotes, which are known predators of whitetail deer (especially young fawns). That’s nature. 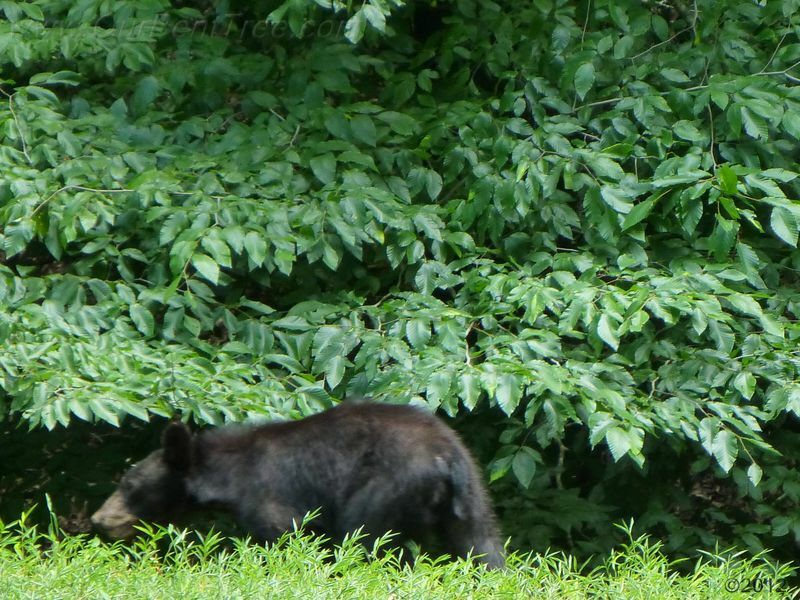 In fact, a bear came around while the newborns were still here, but something startled the bear and it ran into the woods across the street. Both fawns were seen the next morning. I haven’t seen the fawns since, but their mother has come by every day. Maybe she’s found a nice cool place in the woods for her fawns to hide and escape the heat. 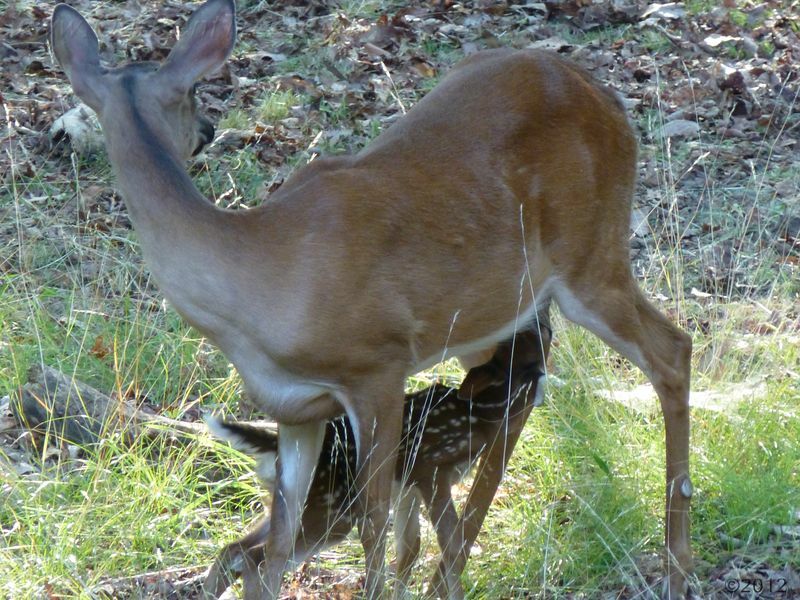 Mother deer leave their fawns for hours at a time (hiding them in separate places if she has multiples). 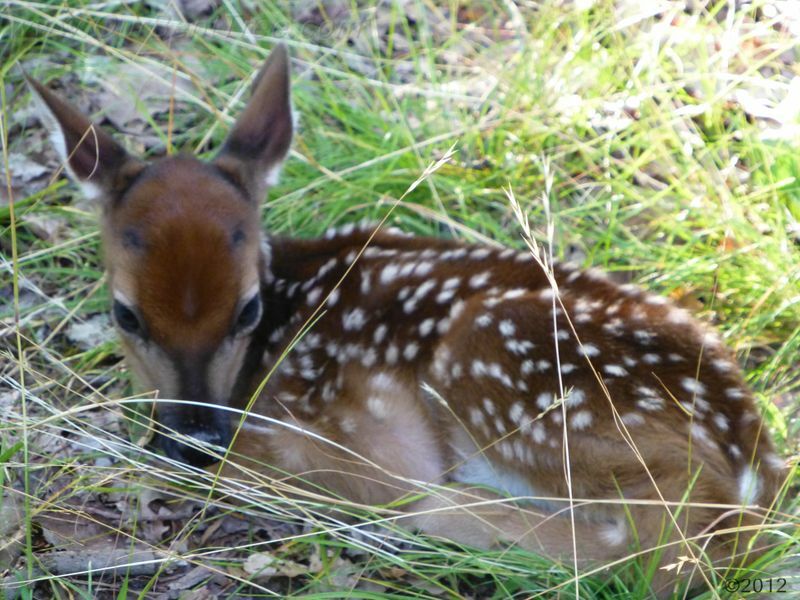 Newborn fawns have no scent. This makes it harder for predators to find them.